Think of a string of beautiful colorful beads, gathered from many forgotten pieces of jewelry and strung together to create something novel. That was the image we got while enjoying Victor Herbert Renaissance Project LIVE! last night. Instead of presenting another complete operetta by this most prolific composer, Artistic Director Alyce Mott decided to create an evening of rarely heard gems extracted from a number of his operettas, written with a variety of librettists, including Henry Blossom, Gene Buck, Buddy De Sylva, Glen MacDonough, Harry B. Smith, and Robert B. Smith. 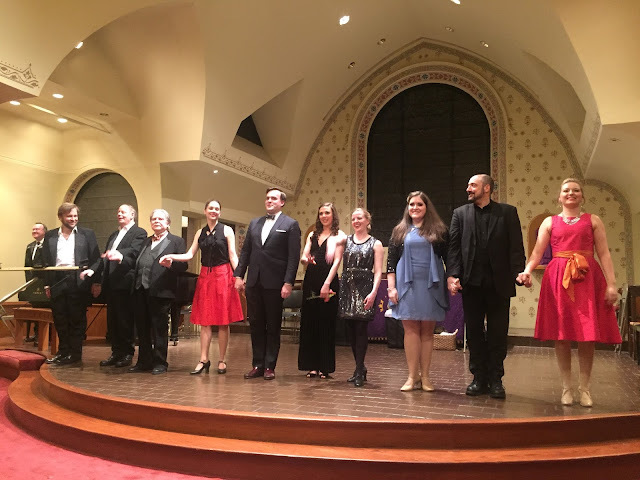 As usual, Ms. Mott supplied the libretto; the performers--gifted vocally and dramatically in equal measure--brought the songs to vivid life, under the direction of Emily Cornelius with charming choreography by Susanna Organic. Michael Thomas ably filled the job of Music Director and pianist. Over the past couple of years attending these performances, we have developed an affection for what appears to be a repertory company. We can almost predict what roles each performer will play. There is a similarity to Herbert's "ladies" and he loves putting them in ridiculous situations. We saw scenes extracted from ten of his lesser known operettas dating from The Idol's Eye in 1897 to his very last one, the 1922 Orange Blossom. Herbert dominated Broadway for a quarter of a century and did not alter his style very much. He had a clear opinion of what his audience wanted and he gave it to them--interesting characters dealing with preposterous situations in a light-hearted manner. We are glad that Ms. Mott compared Herbert to Sondheim. What other American composer beside Sondheim has ever managed to marry word and musical phrase in such an engaging manner! If only we had clever lyrics like that to listen to today! Which brings us to our only criticism--the clever lyrics were not always clear. But that happened only about 10% of the time and only bothered us because the rhymes were so darned clever. Tanya Roberts and Anthony Maida did a swell job as narrators, establishing the background of each scene. Ms. Roberts was hilarious as "the 5' lady with the 8' kick". David Seatter delighted us as a hot air balloonist who "just dropped in" as he circumnavigated the world. And Mr. Seatter enunciated each word clearly. Alexa Devlin made use of the lower end of her register in "Song of the Priestess". These three songs from the 1897 The Idol's Eye made us want to see the entire work. The complex overlapping vocal lines for the Ensemble in "The Face Behind the Mask" was the standout number from the 1914 The Debutante. It revealed Herbert as the gifted composer he was. From the 1905 Mlle. Modiste, our favorite number was the marvelous satire involving a girl from Iowa--"The Keokuk Culture Club", sensationally performed by Ms. Devlin. It seemed very au courant. Another sensational performance was that of Natalie Ballenger who portrayed a very catty woman in "She's a Very Dear Friend of Mine" from the 1904 It Happened in Nordland. Tenor Daniel Greenwood paid vocal tribute to women in "The Century Girl", the hit number from the 1916 show of the same name. Mr. Maida filled a similar role as he idealized "The Princess of My Dreams" from Ziegfield Follies of 1921. The 1922 Orange Blossoms contained two numbers that scored. In "New York is the Same Old Place", Ms. Roberts and Mr. Seatter had complaints about our fair city that seemed not to have changed in almost a century! But the very funny "Way Out West in Jersey" had Ms. Devlin and bass-baritone Matthew Wages contemplating a move to the wild west across the Hudson River. Richard Holmes was absolutely charming as a former roué in "This Time It's Love". Joanie Brittingham had fun portraying a woman whose education was deficient in "Professor Cupid" from The Debutante of 1914 and a sadder girl indeed in "The Lonely Nest" (from Orange Blossoms), in which Michael Thomas' piano stood out. Sarah Caldwell Smith made the perfect ingenue in "If I Were on the Stage" from Mlle. Modiste. The ensemble work showed evidence of a great team spirit in this company. The entire evening was sheer delight. Upcoming in April will be The Enchantress, from which we heard two numbers; but in April we will get to hear them with an orchestra. Yay! Ms. Mott asked the audience which Herbert operetta they would like to see. What a difficult choice! Based on what we most enjoyed last night, we would vote for Orange Blossoms. Labels: Alexa Devlin, Anthony Maida, Daniel Greenwood, David Seatter, Joanie Brittingham, Matthew Wages, Natalie Ballenger, Richard Holmes, Sarah Caldwell Smith, Tanya Roberts, Victor Herbert Renaissance Project Live!